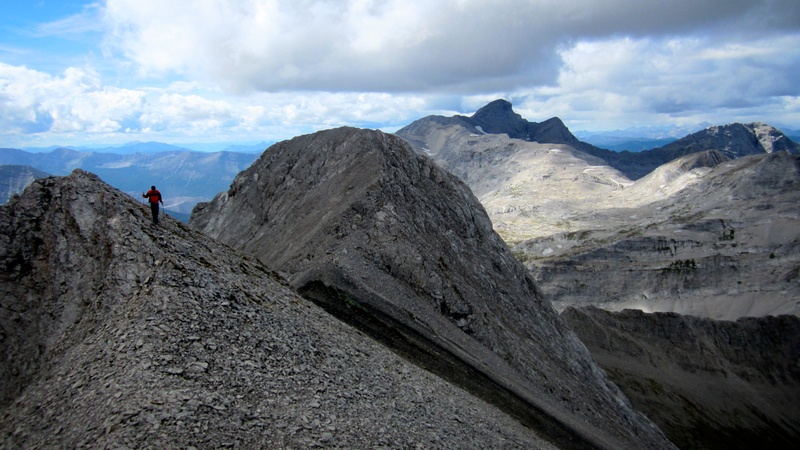 Mount Coulthard (left) from the summit of Mount McLaren. The views from Mount Coulthard are spectacular! 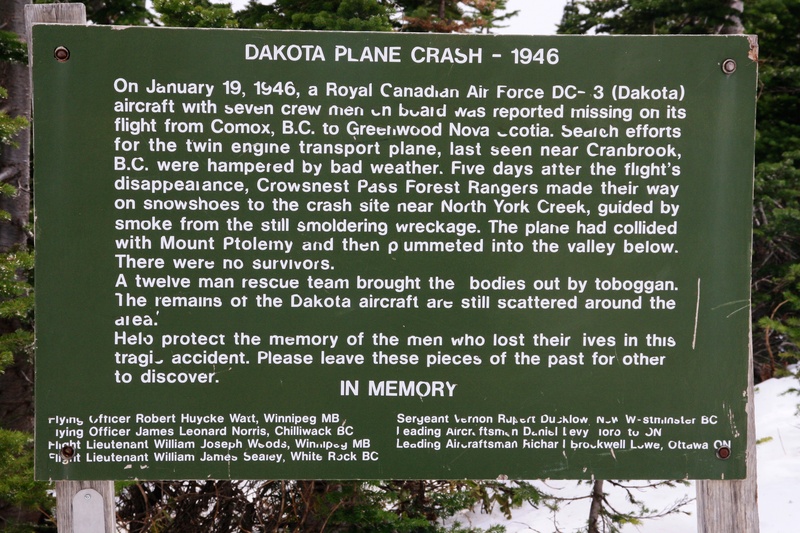 For the second time in under a year, I ventured up the North York Creek Trail south of Coleman, AB, to the place where, in 1946, all 7 crew members aboard an RCAF DC-3 Dakota died when it crashed en route from Comox, B.C. to Greenwood, Nova Scotia. 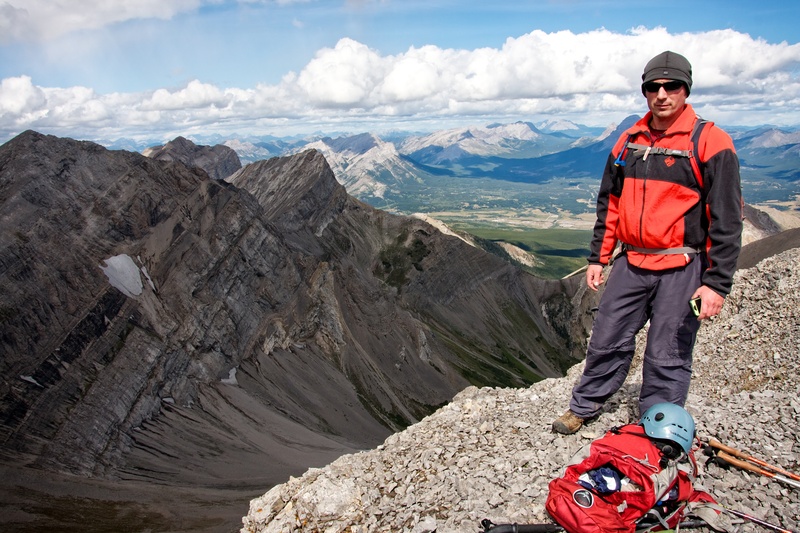 I first visited the site last October after summiting nearby Mount McLaren with my friends Brad and Dave. This time however, my reason for visiting was to climb Mount Coulthard and joining me was my usual hiking buddy, Jeff Lang, who had never been to this locale before. 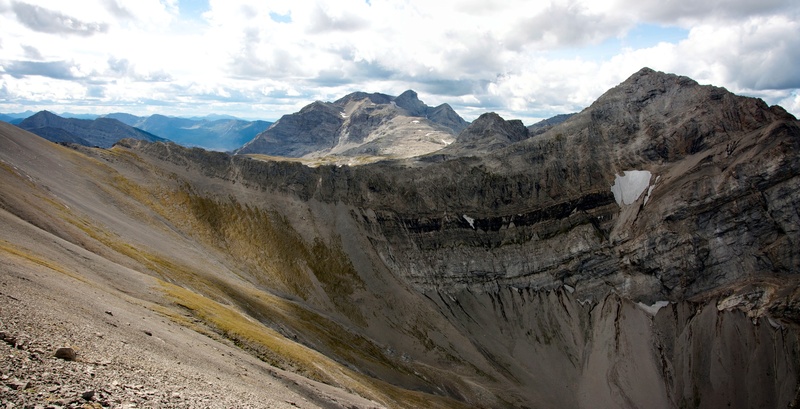 Marking the northeastern end of the Flathead Range, Mount Coulthard is one of the more prominent mountains in the region and offers sweeping panoramic views of not only the Crowsnest Pass, but also the Castle Crown and the Andy Good Plateau. According to Bivouac, the mountain is named after R.W. Coulthard who “was a prominent mining engineer and the general manager of West Canadian Coal Company” at the turn of the 20th century. 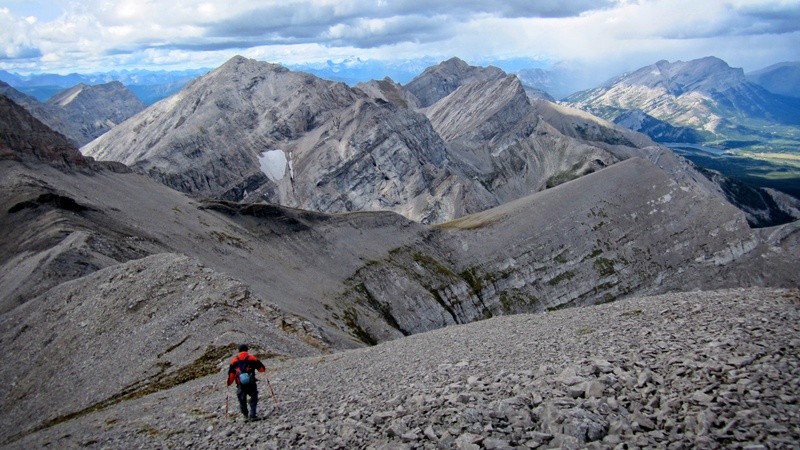 Mount Coulthard is not a difficult ascent, requiring endurance more than anything else simple due to the distance involved. 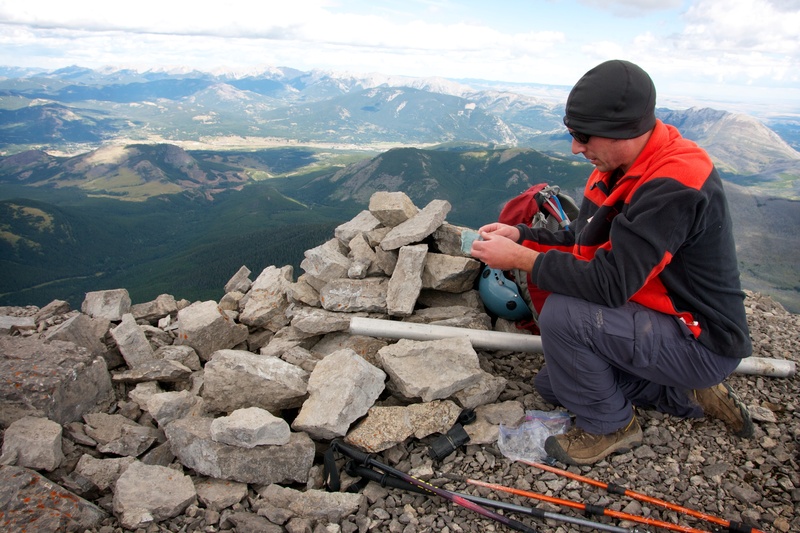 A somewhat popular destination, the summit register consisted of an ABS tube without a lid and an open Ziplock bag that contained soggy pieces of paper. What we could read included entries from 1999 onwards. 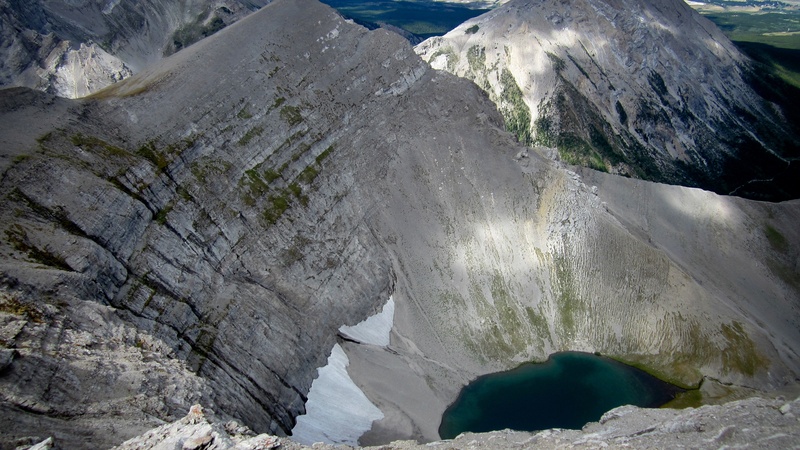 Mount Coulthard has three peaks with the northernmost being the summit. 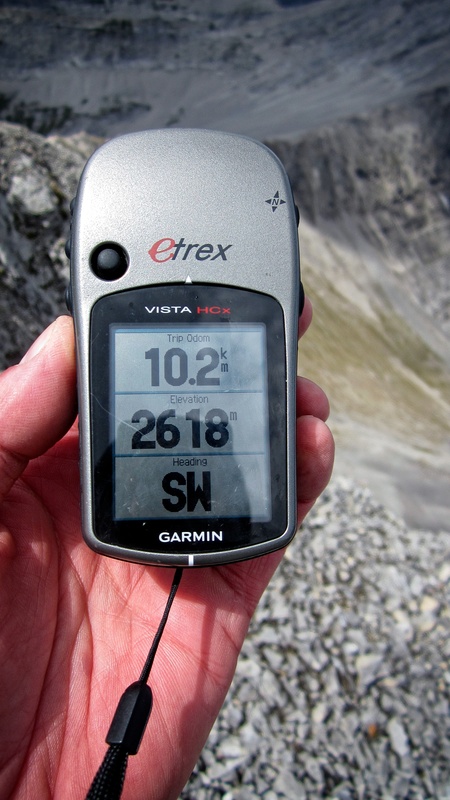 We decided that we would start by summiting the south peak first, and then work our way over to the centre peak, and then to the summit – each being progressively higher in elevation. On our descent, we also made the easy hike up the outlier immediately above the plane crash site, which I called, ‘Little C’ for little Coulthard. I would highly recommend visiting all of these destinations on Mount Coulthard as each peak offers its own distinctive views. 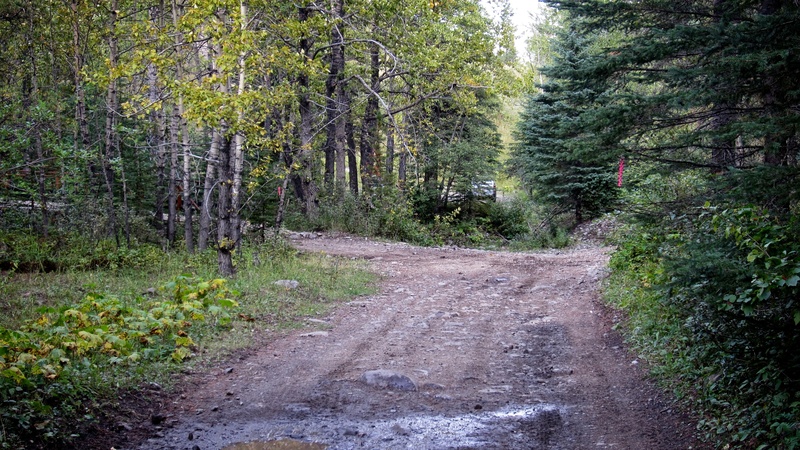 Oh, and if you are the ‘hiking for peace and quiet’ type, you won’t find that until after you begin to ascend from the plane crash site, as on any given day during the weekend, dozens upon dozens of ATVs and 4x4s use the North York Trail to visit the wreckage. 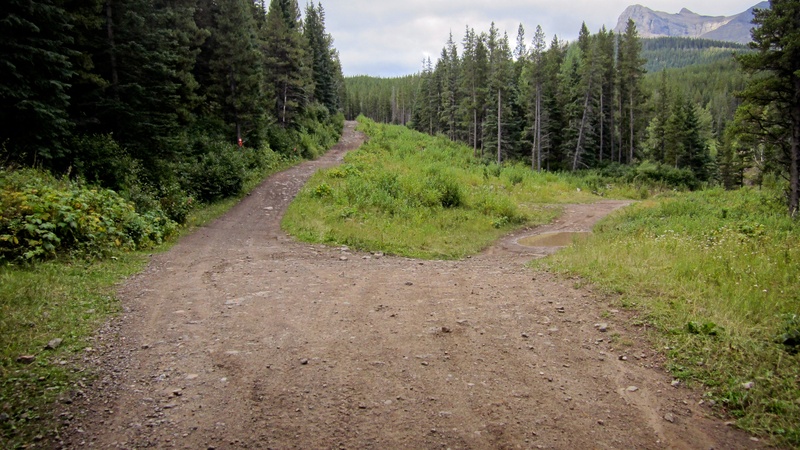 Our route followed the North York Creek Trail which begins about 4km south of Coleman, AB. Just before the road crosses York Creek over the yellow bridge, we pulled over and parked in a clearing on the right hand side next to the Creek. From here, we crossed a narrow red bridge and followed the road left at the first junction, right at the second junction, and right at the third junction, until we came to the plane crash. The distance from our vehicle to the plane crash was 7.7km. 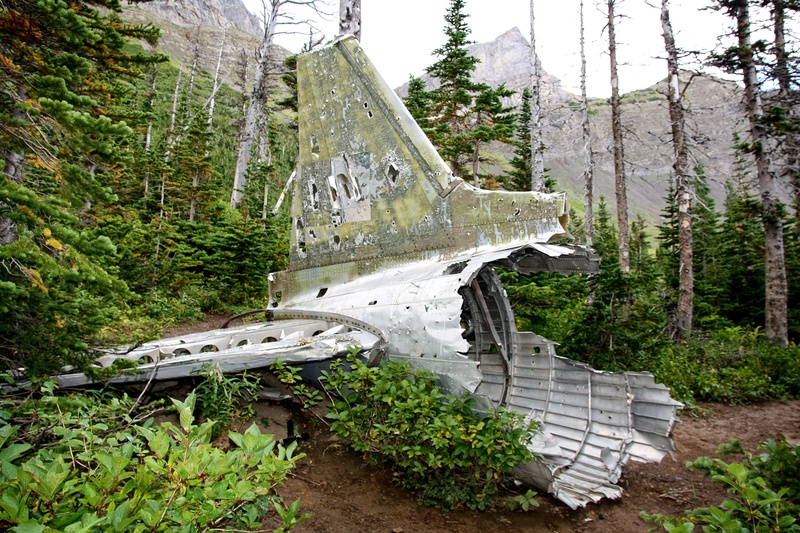 From the plane crash we followed an obvious trail up to the cirque between Andy Good Peak and Mount Coulthard. 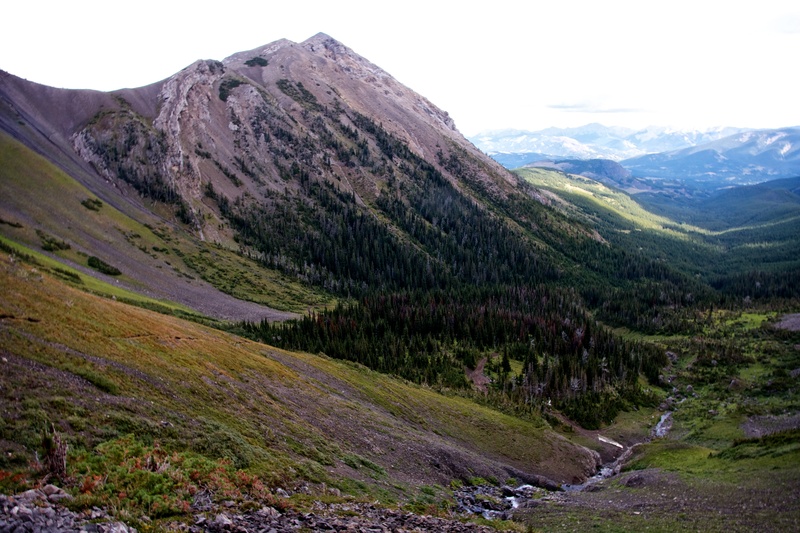 From here, we hiked towards the far end of the cirque until we passed the waterfall and cliff bands, before starting up the steep, vegetation-covered slopes directly beneath the south peak. It’s a fairly steep slog up the slope but there is nothing technical, just grunt work. 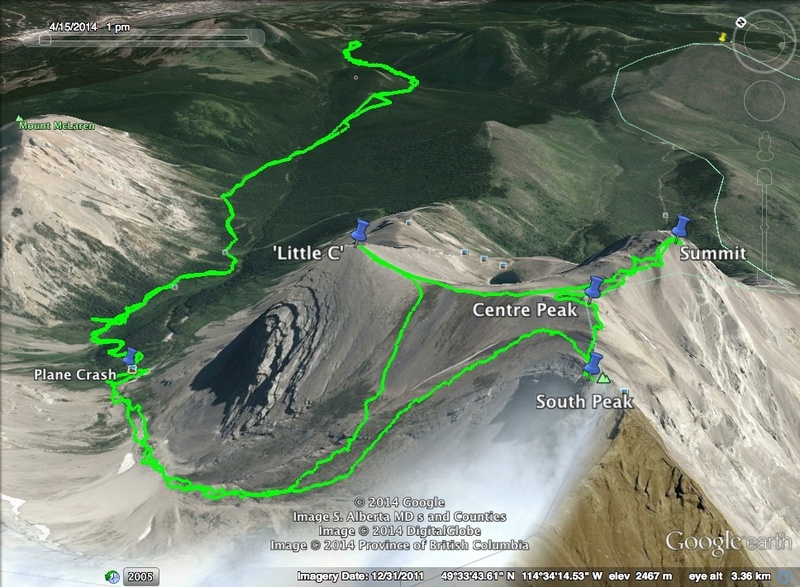 The distance from the plane crash to the south peak was 2.5km. Once on the ridge, travel between the peaks is not too difficult though we had to lose elevation by dropping back down the slope to get from the centre peak to the summit ridge because the north face of the centre peak is marked by a steep cliff. There are several goat trails that side slope beneath the centre peak but we had no difficulty crossing the scree directly beneath the cliff. 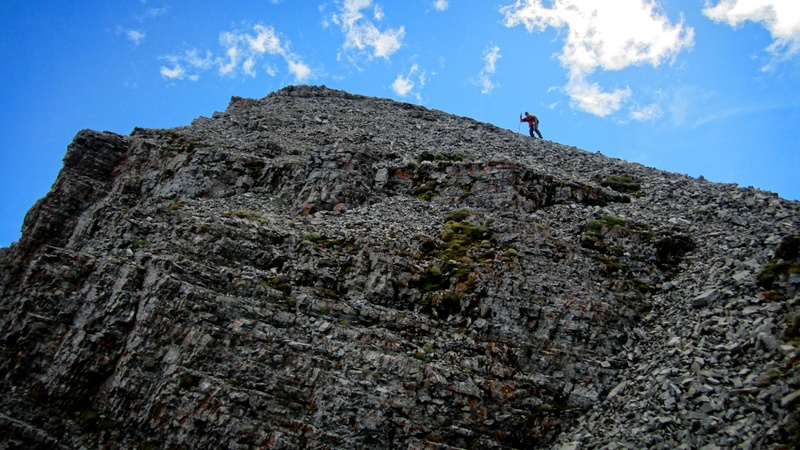 Once on the summit ridge, it’s an easy hike to the summit (~900m from the south peak and ~600m from centre peak). From the summit we descended by using one of the lower goat trails to side slope over to a col beneath ‘Little C’. After reaching the cairn at the top of ‘Little C’ we descended back into the cirque, crossing the creek just above the waterfall and doing a small bit of down climbing on the cliff bands. From here we joined our original route and followed it back to the plane crash site and back out along the North York Creek Trail. 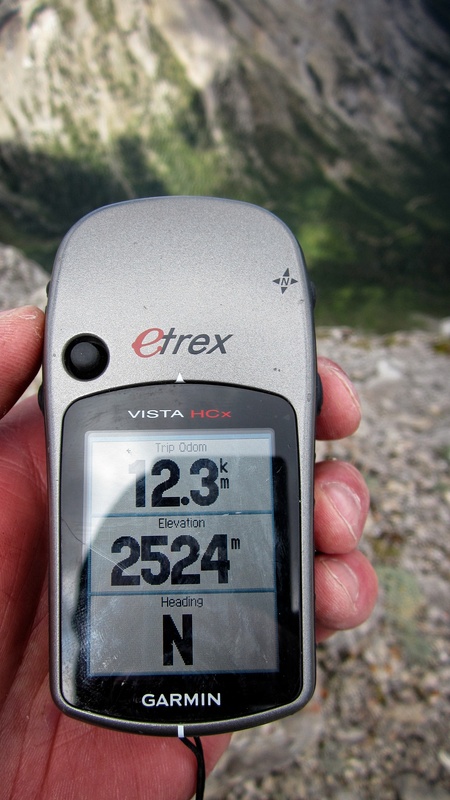 The total distance for our hike was 23km and the total time was 8hrs and 26 minutes. 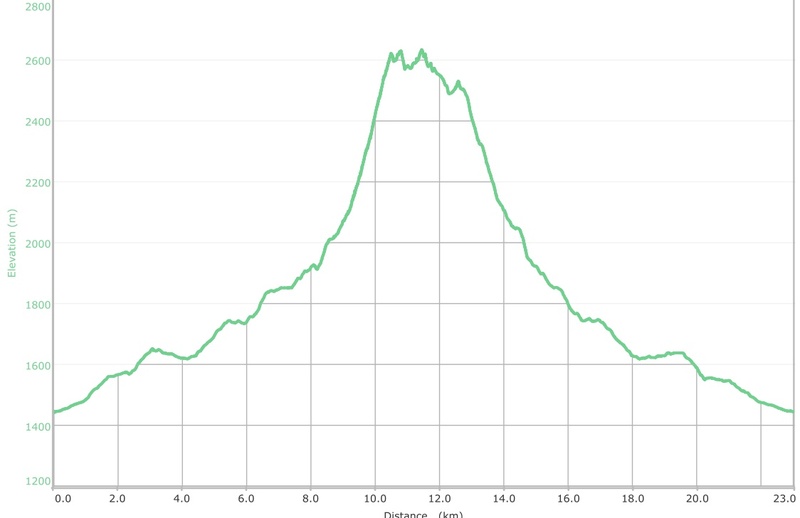 Total elevation gains were 1480m. For fun, we punched this information into Jeff’s handy exercise app which then told us that we had each burned over 4400 calories. I’ve always wondered how many calories I burn while hiking and how this compares to what I burn when I run. Our starting point was next to the yellow bridge that crossed York Creek. At the first junction we kept to the left. Since my last trip up this section of the trail when we ascended the NW end of Willoughby Ridge, a new sign has been added directing traffic to the left. The lower section of the trail along the creek has been closed for restoration work. After going right at the second junction, we came to this, the third junction, where we took the road on the right. 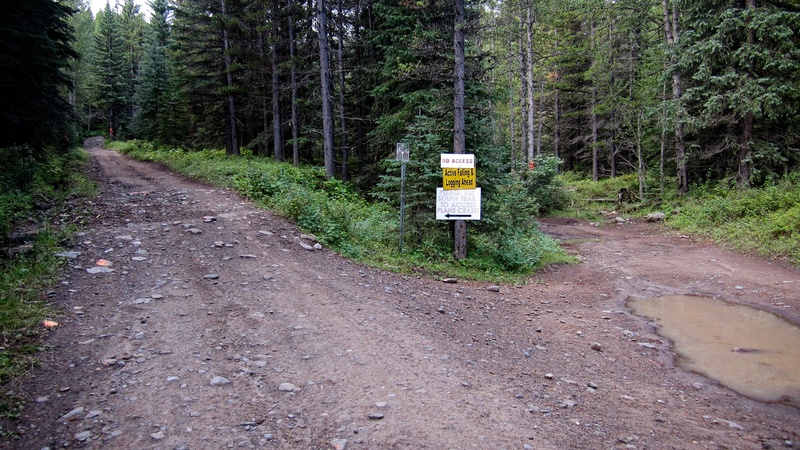 Going straight would lead to the Ironstone Fire Lookout on the top of Willoughby Ridge. 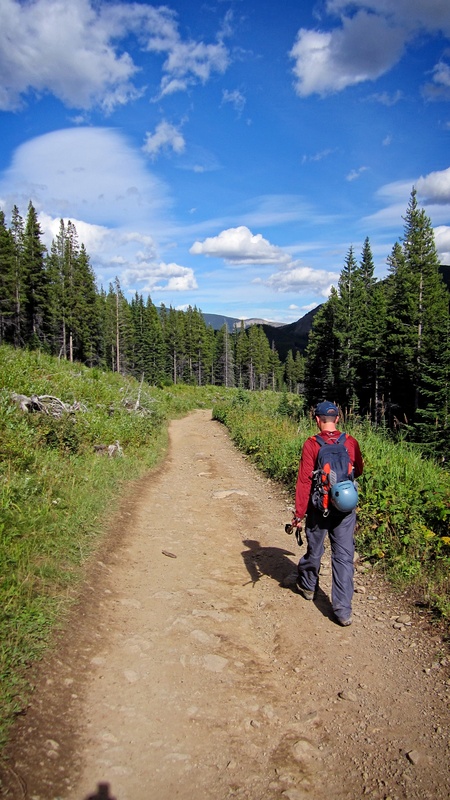 After crossing the creek and gaining some elevation, the views began to open up. 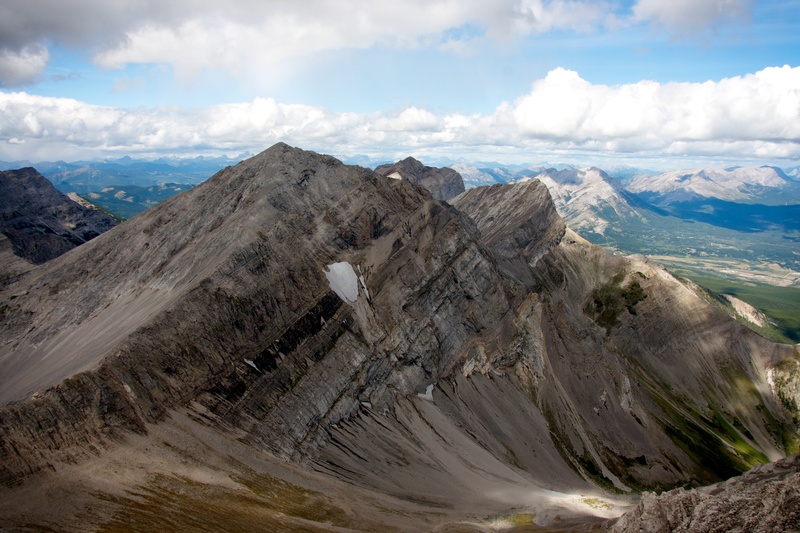 From left to right: Mount Coulthard, Andy Good Peak, Mount Parrish, and Mount McLaren. I’d been telling Jeff that the North York Creek Trail is an ultra busy route for ATV traffic, but since we had started hiking at 9:30 am, we had the trail to ourselves for almost the entire first hour. 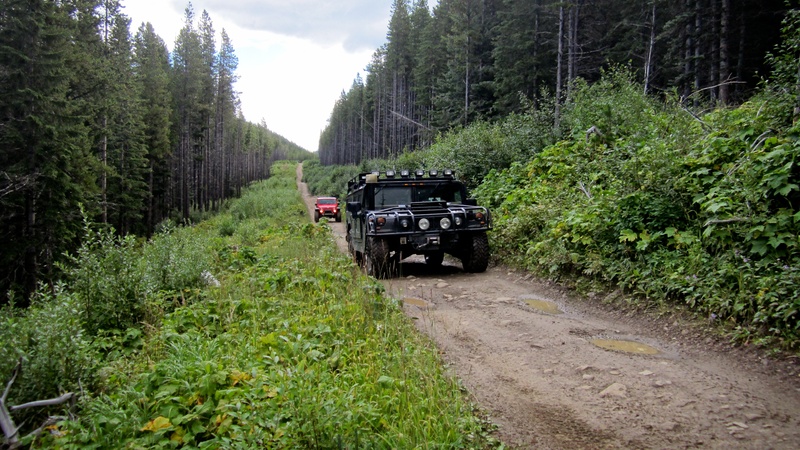 To our surprise, the first off roaders to pass us included this full-sized Hummer H1 and a Jeep. Believe it or not, the Hummer made it to the plane crash site despite its enormity compared to the more narrow sections of the upper trail, and no, Arnold Schwarzenegger was not driving it. In total, we encountered over 50 ATVs and 4x4s on this particular day and this doesn’t include all that would have come and gone during our time on the mountain. 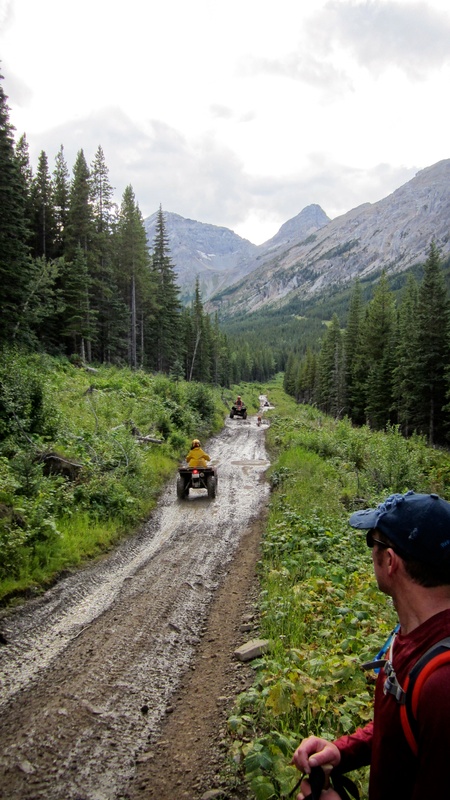 By the end of the day, the clear waters of York Creek were silty from the numerous motorized vehicle crossings as well as from the muddy puddles which drained into the Creek from the trail. 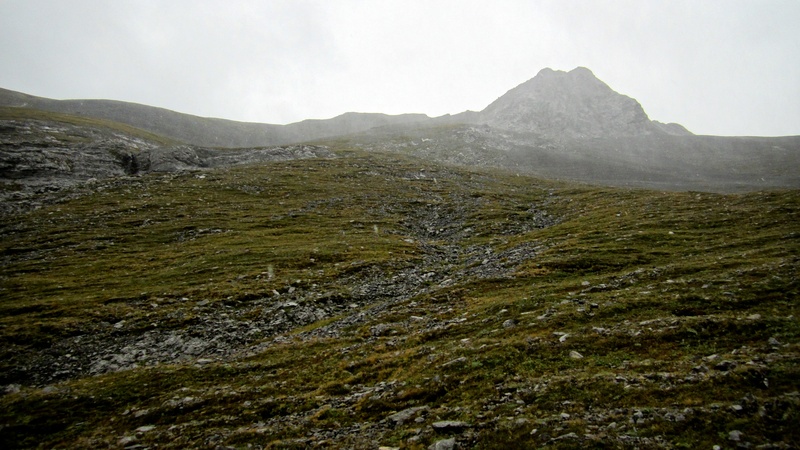 Looking up at the ascent slope that we used on Mount McLaren in October 2013. 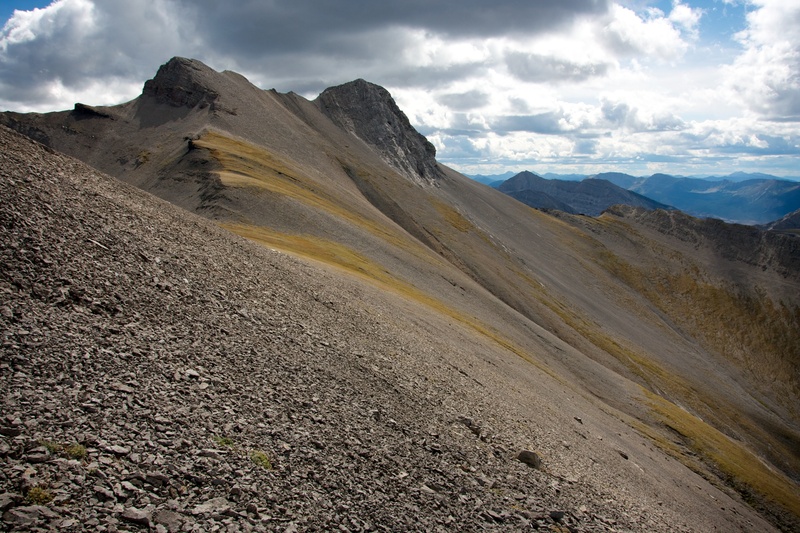 A view of ‘Little C’ (Little Coulthard) and the entrance to the cirque (right) from the trail just below the crash site. Note the large cave on the cliff face of ‘Little C’. The sign located at the crash site. After visiting this site for a second time, I still find it hard to believe that the plane hit Mount Ptolemy and ended up at the base of Mount Coulthard and Andy Good. 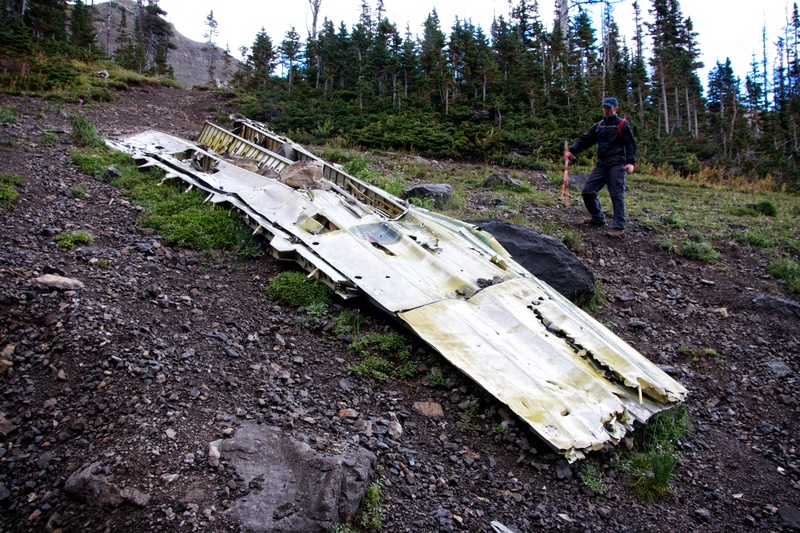 I think it is more likely that the plane hit Andy Good Peak or Mount Parrish. Jeff inspects the tail section of the plane. Jeff stands next to one of the wings. 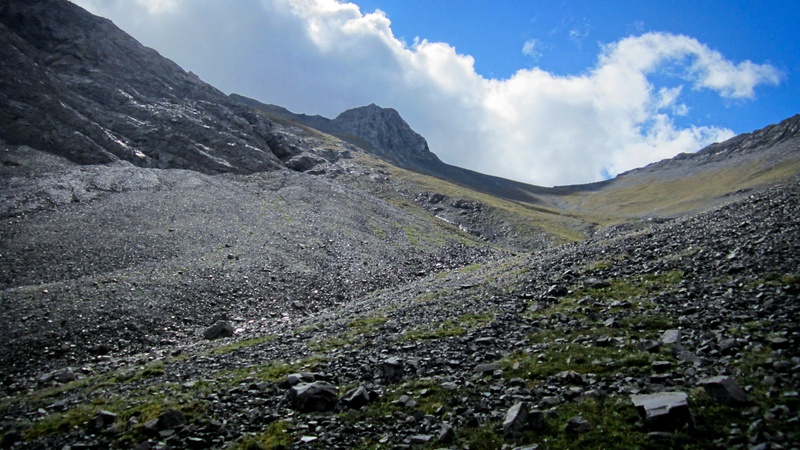 Looking back at Mount McLaren and the crash site from the entrance to the cirque. You can see a wing from the plane lying next to the creek bed. The changing weather throughout the day made for some great atmospherics and photo opportunities. Here, Jeff is silhouetted as he walks through the meadow at the entrance to the cirque. Mount McLaren is behind him. 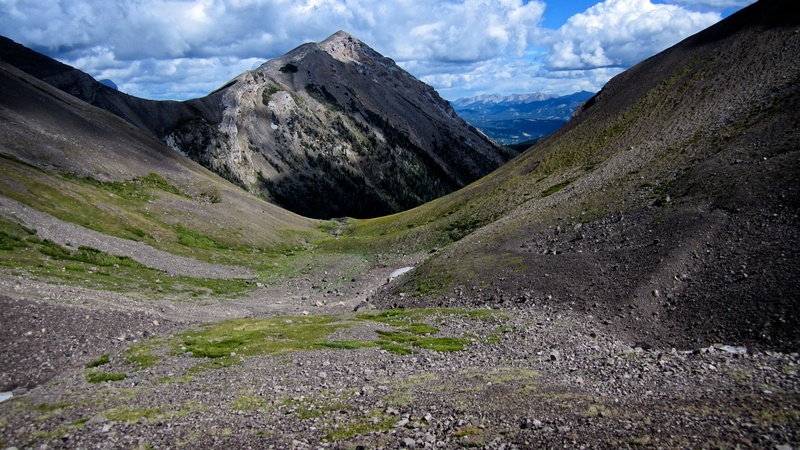 Looking up the cirque towards the south peak of Mount Coulthard. Our ascent route followed the slope immediately beneath this peak. Looking back at Mount McLaren after hiking a short distance into the cirque. Looking up our ascent route at the south peak. Sheets of rain mixed with ice pellets can be seen heading towards us. Fortunately, the inclement weather didn’t last too long. Looking back at Andy Good Peak, Mount Parrish, and Crowsnest Mountain from part way up the slope. A view of the Andy Good Plateau from just below the south peak. Mount Ptolemy is the tall peak on the left and Andy Good Peak is on the right. Peak 3 (“Pharaoh’s Peak”) of the Northwest Ridge of Ptolemy (NROP) is in the background to the right of centre. 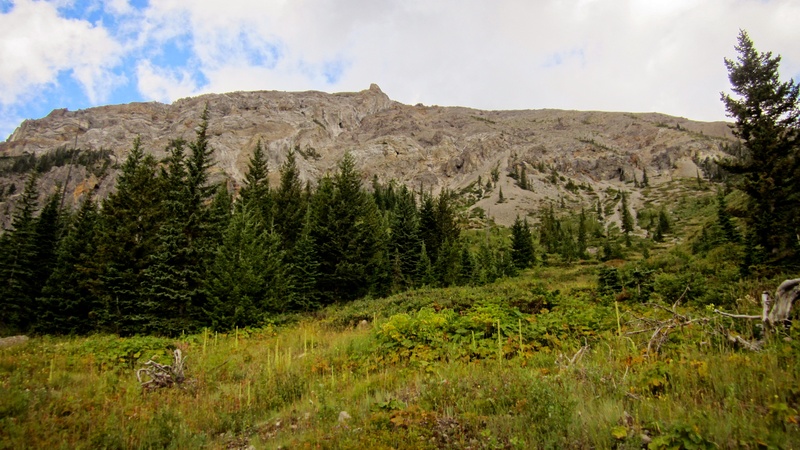 This peak is as high or higher than nearby Chinook Peak. Given the location of the plane crash and the location of Ptolemy, I don’t think the plane hit Ptolemy, but rather collided with either Andy Good or Mount Parrish. 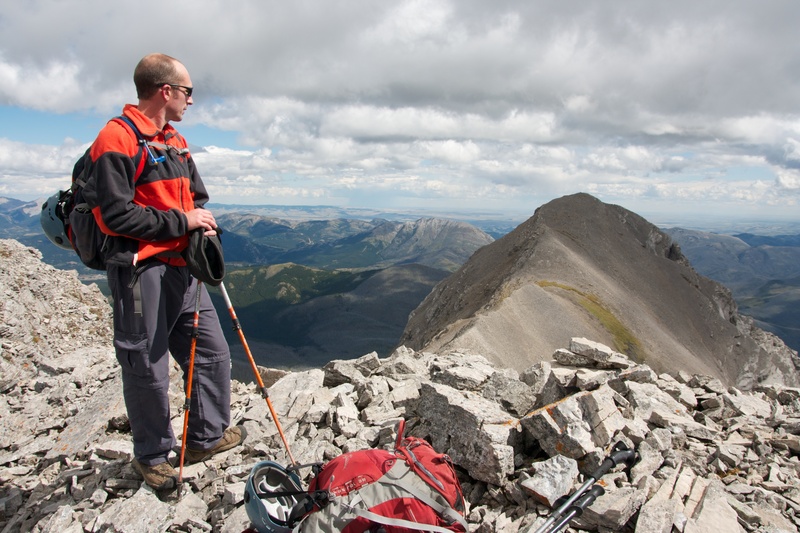 Jeff pauses beneath the south peak of Mount Coulthard to look back at Mount Parrish. Our ascent route came straight up the slope beneath Jeff. 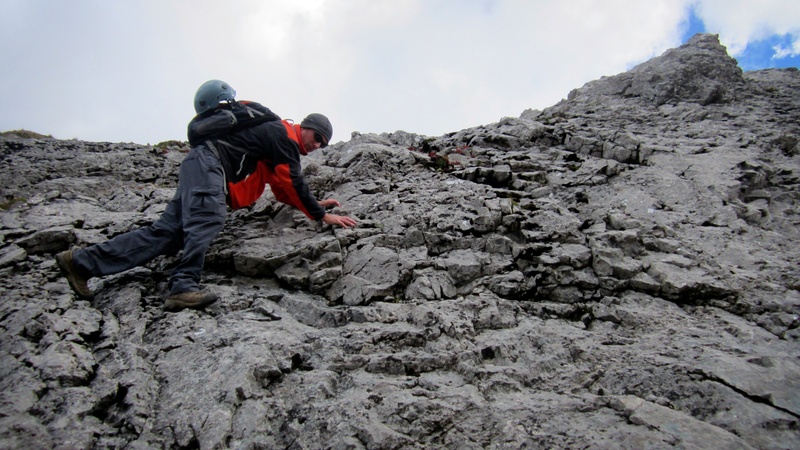 A small bit of scrambling is required to summit the south peak, but nothing serious. 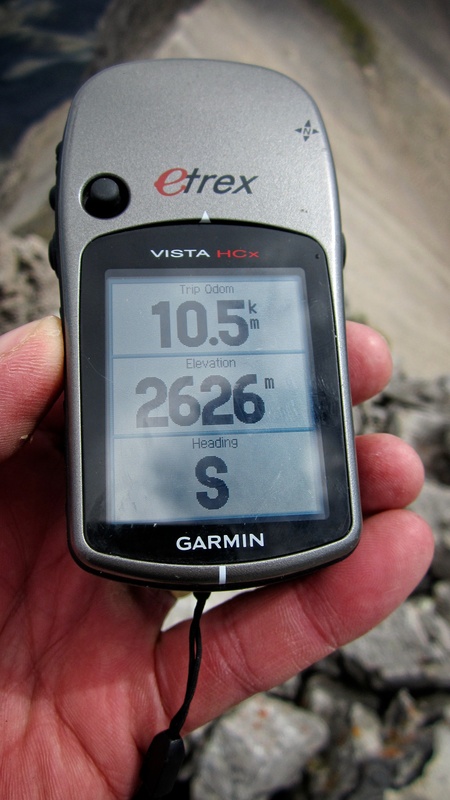 This is the reading on my GPS from above the small cairn located on the south peak. 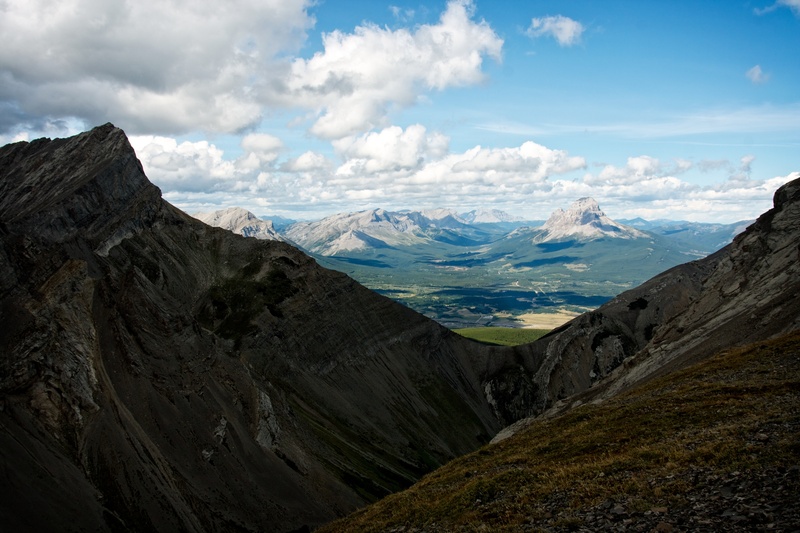 Each peak on Coulthard offers its own unique perspective of the surrounding landscape and it is worth it to visit each one. This is the view to the NW from the summit of the south peak. 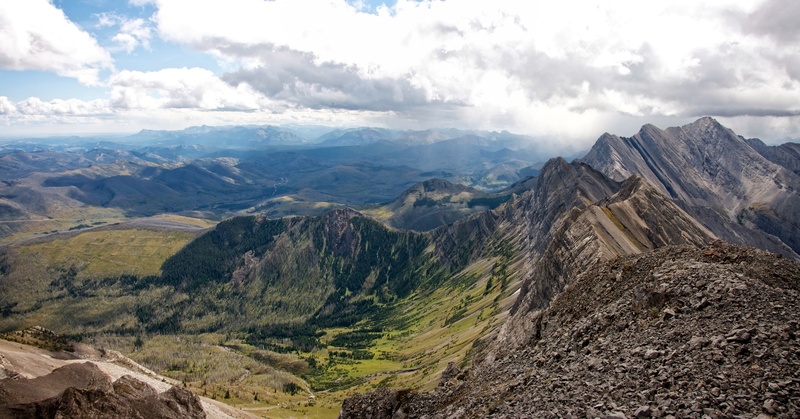 Chinook Peak, Mount Erickson, Mount Tecumseh, Phillipps Peak, “Deadman Peak”, Crowsnest Mountain, and Ma Butte can be seen in the distance. Andy Good Peak and Mount Parrish from the south peak. Chinook Peak is visible just behind. Looking north from the south peak at the centre peak and the summit. Hillcrest Mountain can be seen in the distance just to the right of the summit. Looking south along the Flathead Range. 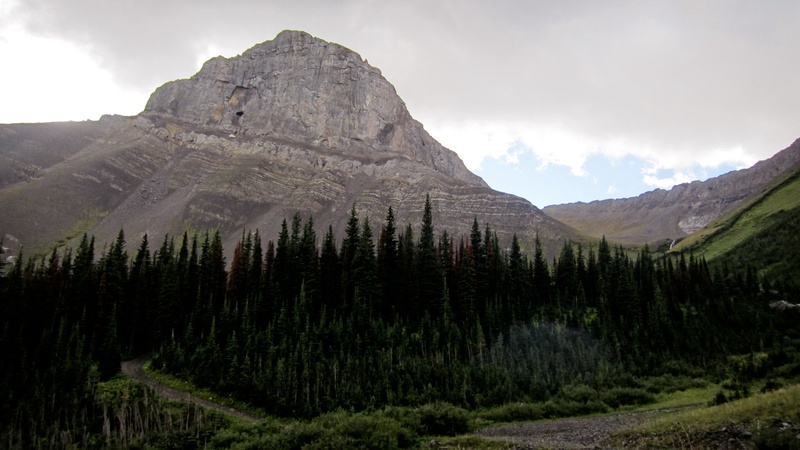 Mount McGladrey (not visible) is behind the tall unnamed peak in the centre. Looking SE from the summit of the south peak at the Castle Crown Region. Prairie Bluff Mountain and Victoria Peak are visible in the far distance on the left. Table Mountain, Whistler Mountain, Carbondale Hill, Mount Backus, Syncline Mountain, and Mount McCarty are also visible. 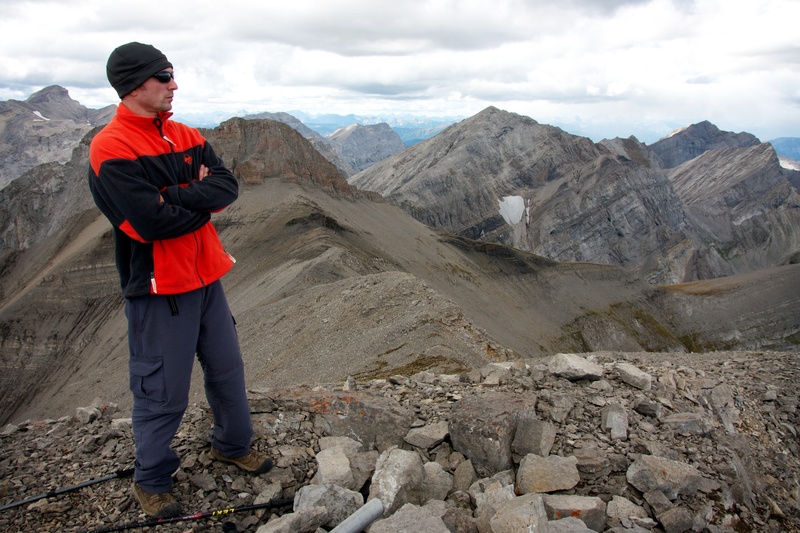 Jeff stands on the summit of the south peak of Mount Coulthard. 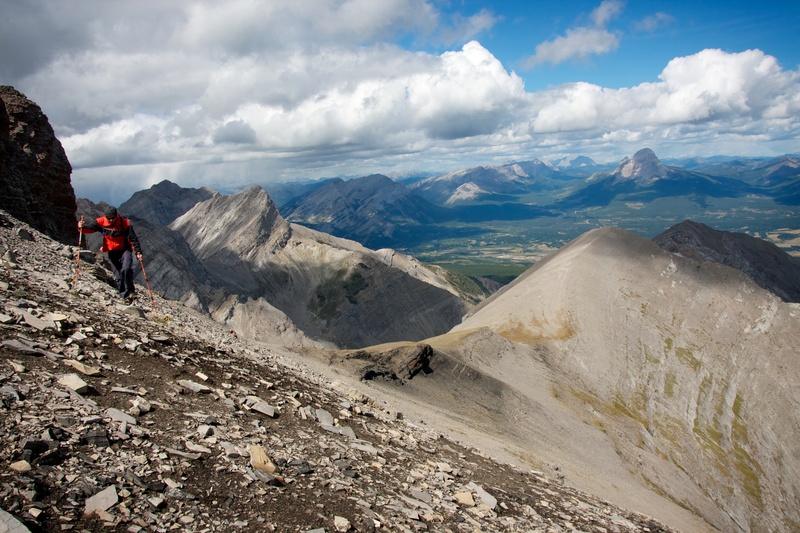 Jeff makes his way off of the south peak as we head toward the centre peak – a distance of ~300m. The south peak and Mount Ptolemy as viewed from near the summit of the centre peak. Peak 3 (“Pharaoh’s Peak”) of the Northwest Ridge of Ptolemy (NROP) is on the far right. If you ever get the chance, NROP is a very fun traverse! A small cairn marks the summit of the centre peak. 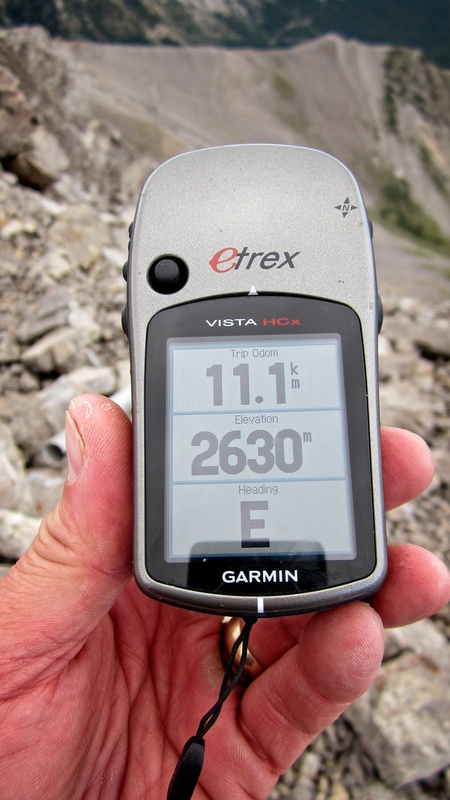 My GPS reading on the summit of the centre peak. It is just 8m taller than the south summit. Looking NE towards the summit from the centre peak, a distance of ~600m. 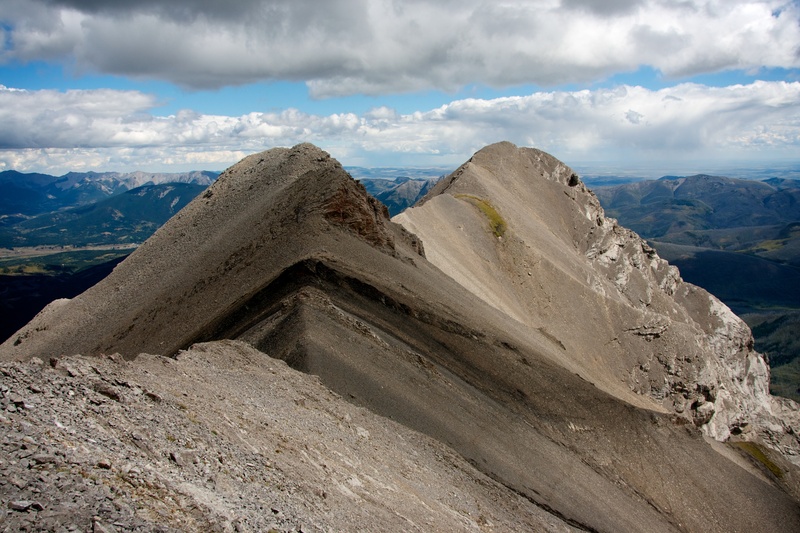 Turtle Mountain is on the left and part of Hillcrest Mountain can be seen just to the right of the summit. 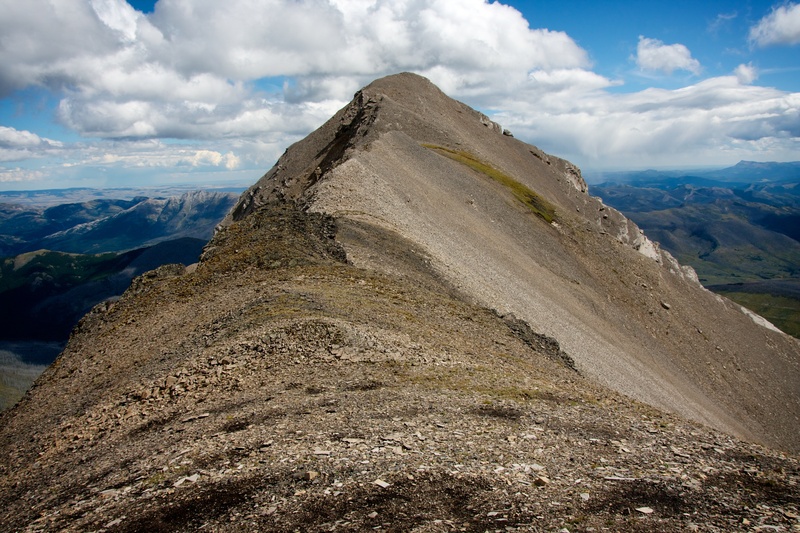 Spades Peak, Clubs Peak, Poker Peak, and Maverick Hill are further to the right of the summit. As I mentioned before, it is worth visiting all of the peaks because each offers its own interesting view. 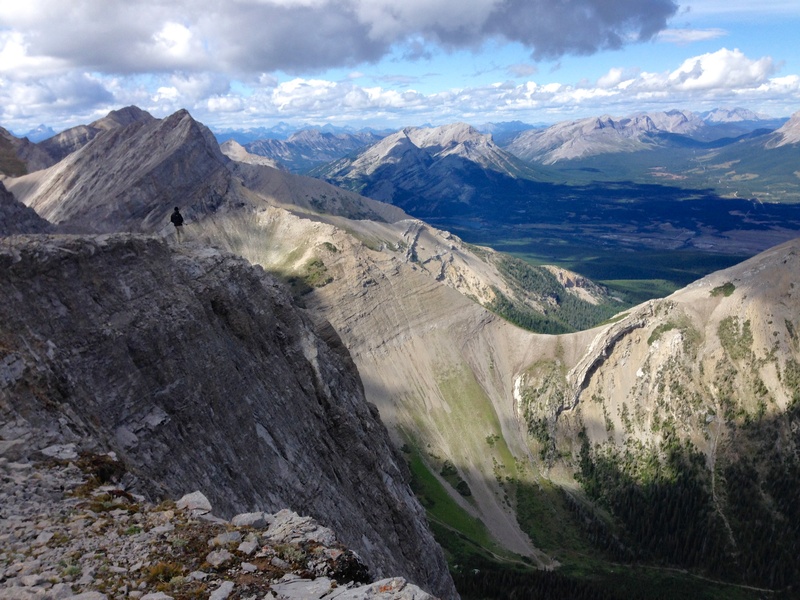 Looking west from the summit of the centre peak (from left to right): the south peak, Mount Ptolemy, “Pharaoh’s Peak” and “Anubis Peak” on NROP, Andy Good Peak, Chinook Peak, Mount Parrish, Mount Tecumseh, Phillipps Peak, “Deadman Peak”, and Crowsnest Mountain. 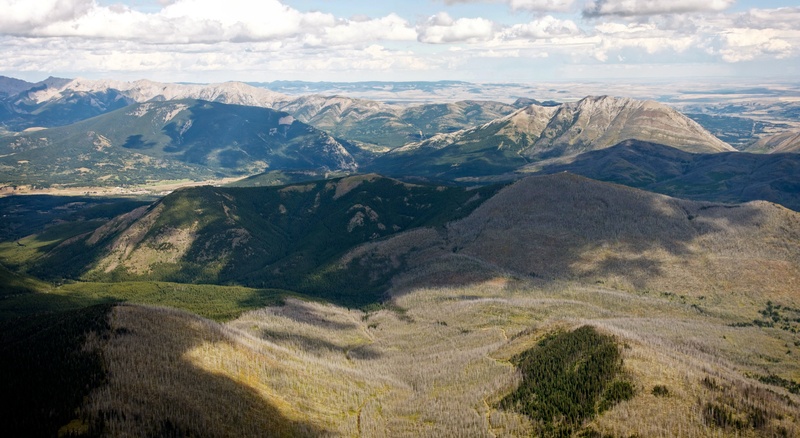 In the far distance, between Tecumseh and Crowsnest Mountain are Allison Peak, Window Mountain, Mount Ward, and Racehorse Mountain. Jeff descends from the centre peak as we make our way to the summit. 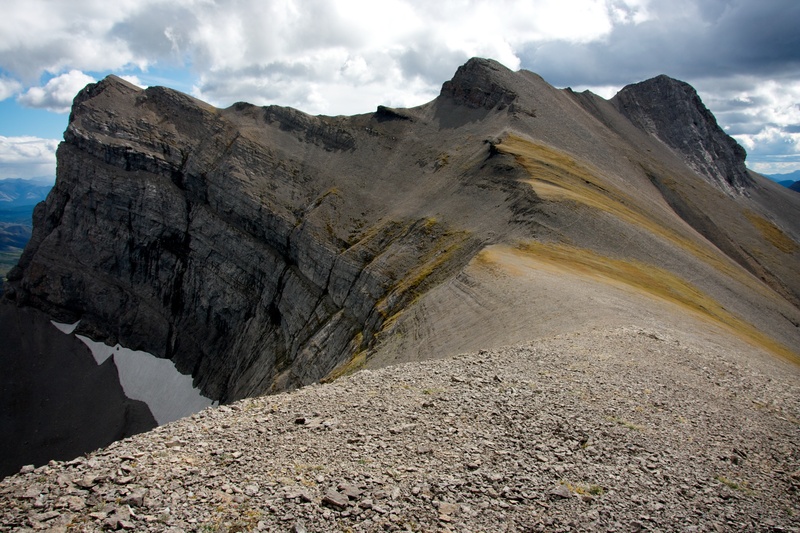 A pretty little tarn is nestled between ‘Little C’ and the summit of Mount Coulthard. Jeff side slopes his way beneath the cliff face of the centre peak. We were fortunate that it turned into a fairly calm day despite the constantly changing weather. This made the short walk along the summit ridge even more enjoyable. Looking back at the centre and south peaks from the summit. 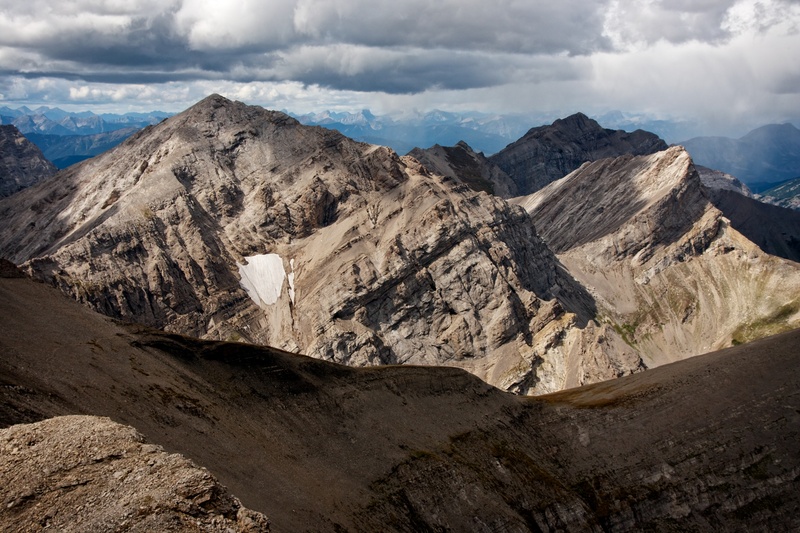 Looking west from the summit (from left to right) at Andy Good Peak, Chinook Peak, Mount Parrish, Mount Erickson, Phillipps Peak, Mount Tecumseh, and “Deadman Peak”. 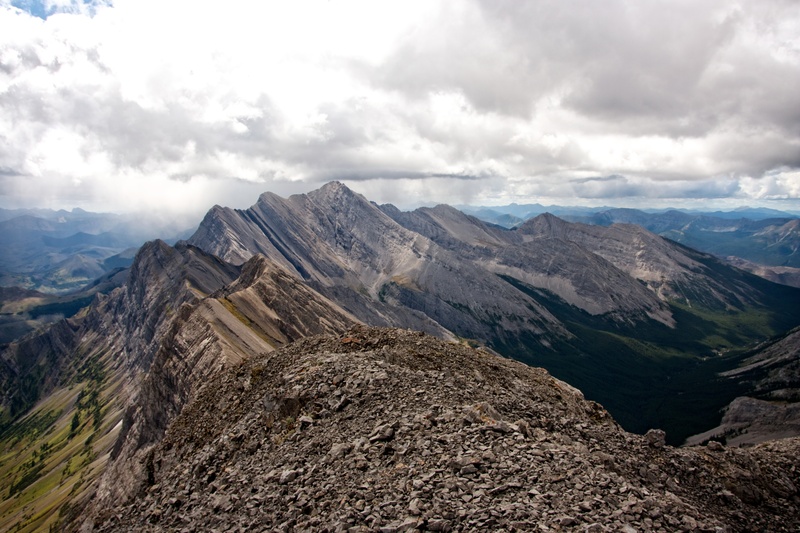 Looking NW from the summit as rain comes down on “Deadman Peak” and Crowsnest Mountain. Mount McLaren is in the foreground on the right. 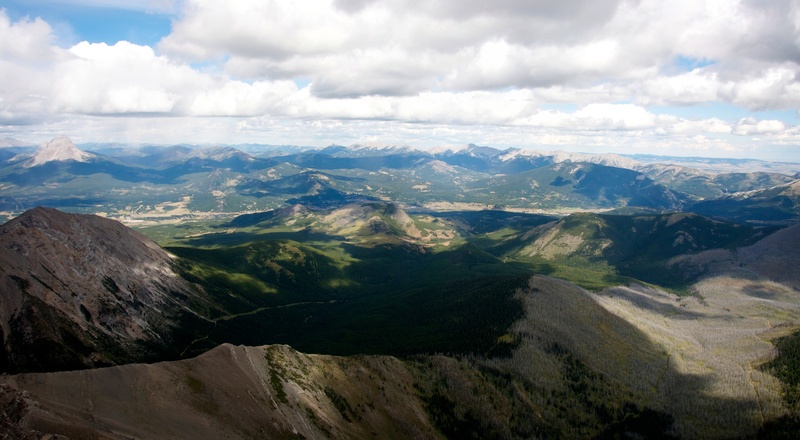 Since the summit extends out to the NE, it not only offers great views of the Crowsnest Pass, but also of the Castle Crown Region. Looking east from the summit (from left to right) at Prairie Bluff, Pincher Ridge, Victoria Peak, Table Mountain, Whistler Mountain, Lys Ridge, Southfork Mountain, and Barnaby Ridge. Looking NE from the summit. 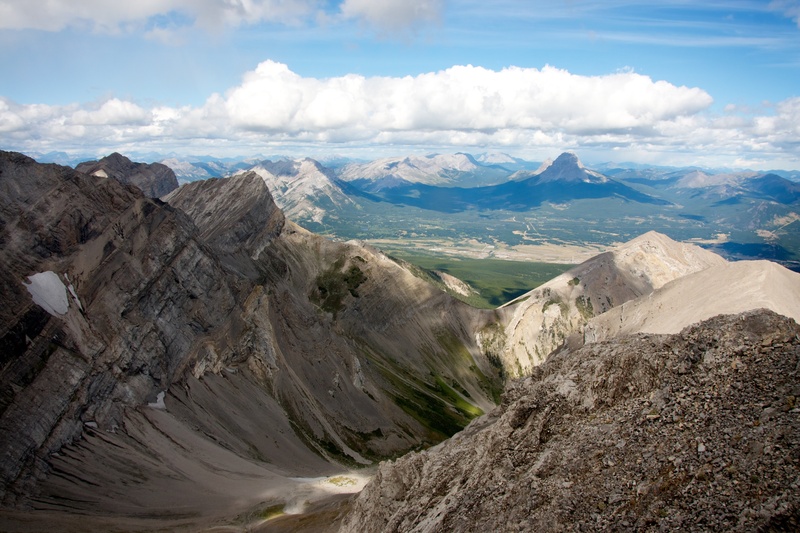 From left to right: Centre Peak Livingstone Range, Bluff Mountain, Morin Peak, “The Dog”, South Peak Livingstone Range, Piiktaistakis Eagle Watch Site, Robertson Peak, and Turtle Mountain. The Ironstone Fire Lookout on Willoughby Ridge is in the foreground. The northern extent of the massive 2003 Lost Creek Fire is also clearly demarcated in the valley below. Looking north from the summit. 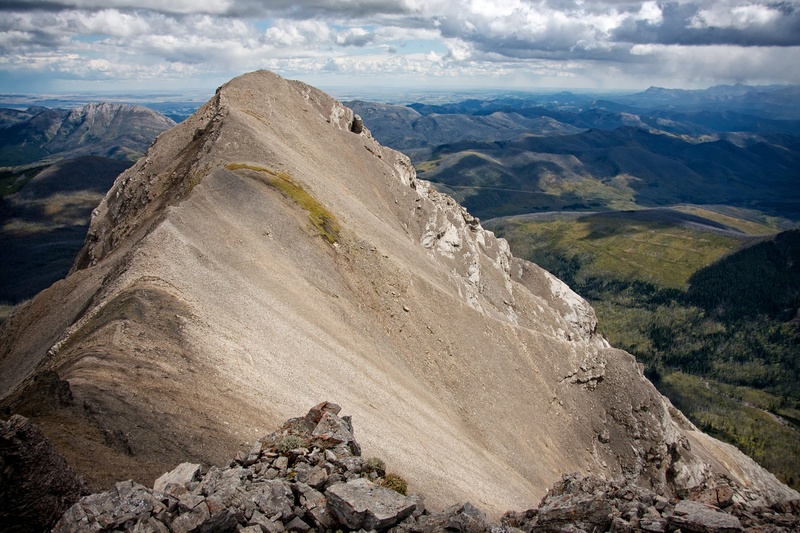 Immediately visible are Crowsnest Mountain, Ma Butte, McGillivray Ridge, Wedge Mountain, “Pa Butte”, Saskatoon Mountain, The Saddle, and Bluff Mountain. Thunder Mountain which is located at the northern end of the Livingstone Range is also visible in the distance. Unfortunately, the container holding the summit registry did not have a lid and the Ziplock bag that was inside was also not sealed properly, so the pieces of paper that comprised the registry were completely soaked. Some of the entries that we could read dated back to 1999. 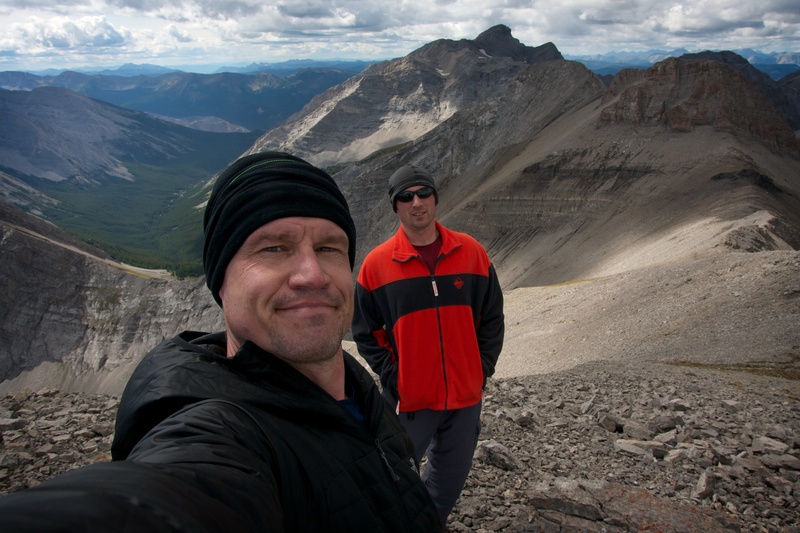 Jeff and I on the summit of Mount Coulthard. The centre and south peaks are behind me. Looking west at Andy Good Peak. The views from Mount Coulthard are outstanding! Looking down from the summit at the pretty tarn. After enjoying the amazing views from the summit, we then headed towards ‘Little C’ which is in the foreground on the right. It’s an easy walk to ‘Little C’ along the connecting ridge. 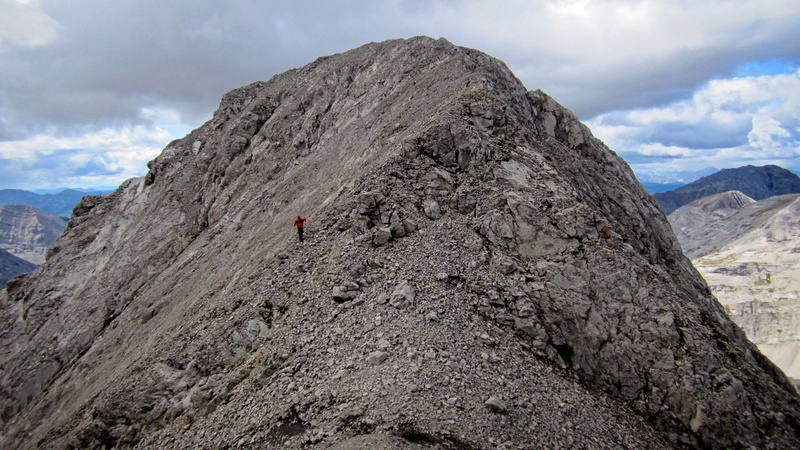 At 2524m, ‘Little C’ is actually 205m higher than nearby Mount McClaren. 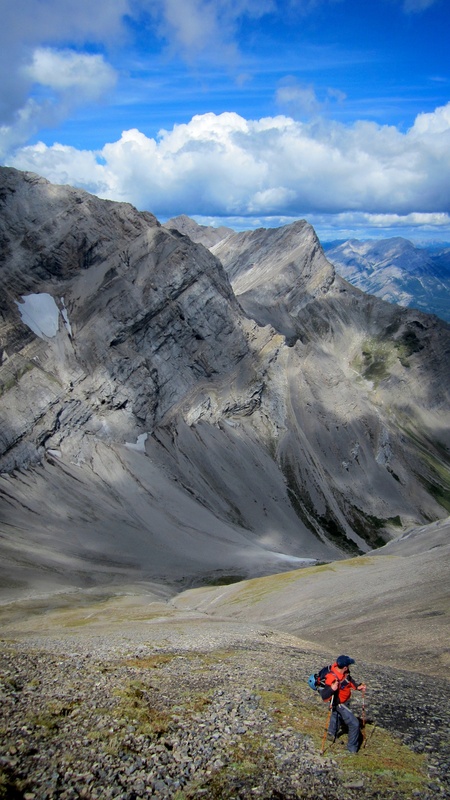 All three of Mount Coulthard’s peaks are visible from ‘Little C’. The summit is on the left and our ascent slope is on the far right. 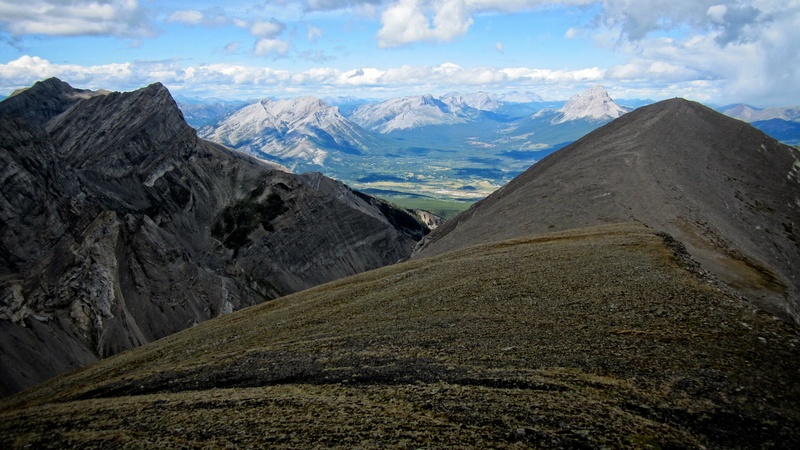 Looking down at the North York Creek Trail and Mount McClaren from ‘Little C’. The plane crash is hidden by the cliffs on the left. Jeff takes a picture of the cairn on top of ‘Little C’. Coulthard’s centre peak is in the background. A good view of our ascent route. 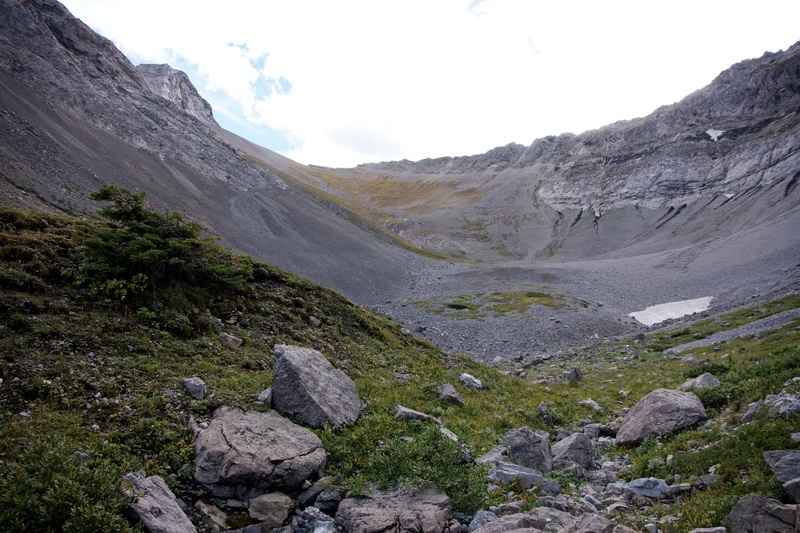 We followed the line of moss covered scree that is visible on the far side of the gully which runs between the centre peak and the south peak. 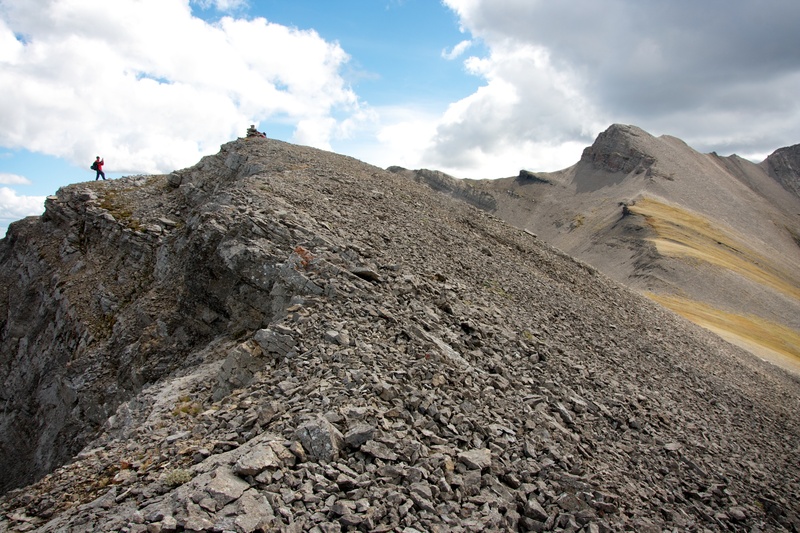 The covered scree runs almost to the base of the south peak. Looking back towards the Andy Good Plateau as we descend. 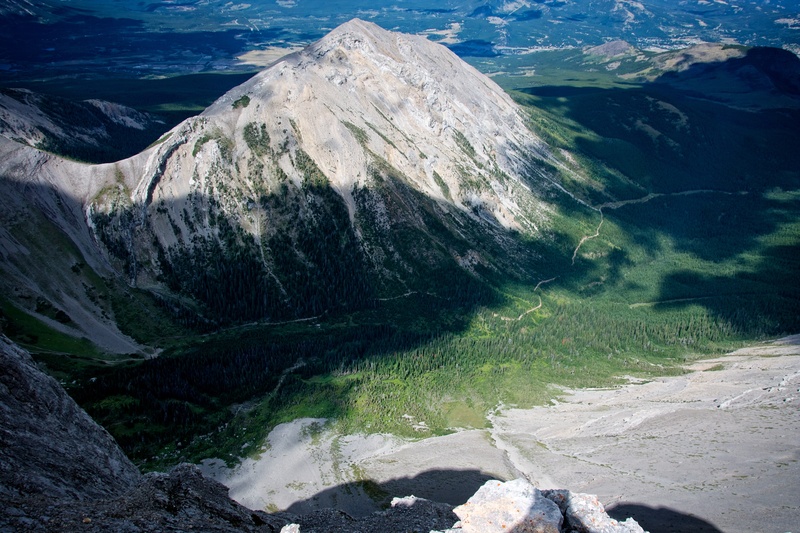 Crowsnest Mountain and the High Rock Range provide us with a scenic descent. 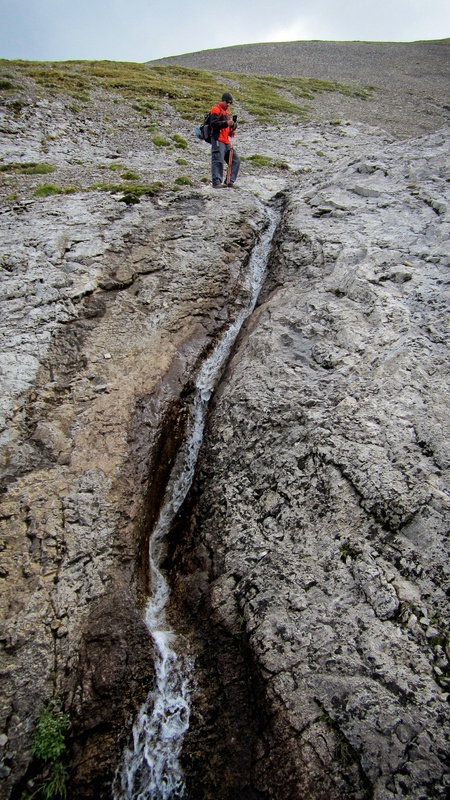 On the way down, we crossed a stream that bubbled out from the side of the mountain and which had eroded its path through solid rock. If it were any wider, it would have made for a naturally smooth water slide – though the landing might be a bit rough :0 A very cool sight nonetheless. Jeff down climbs a short band of rock near a waterfall. These bands might have been fun to go up as well. 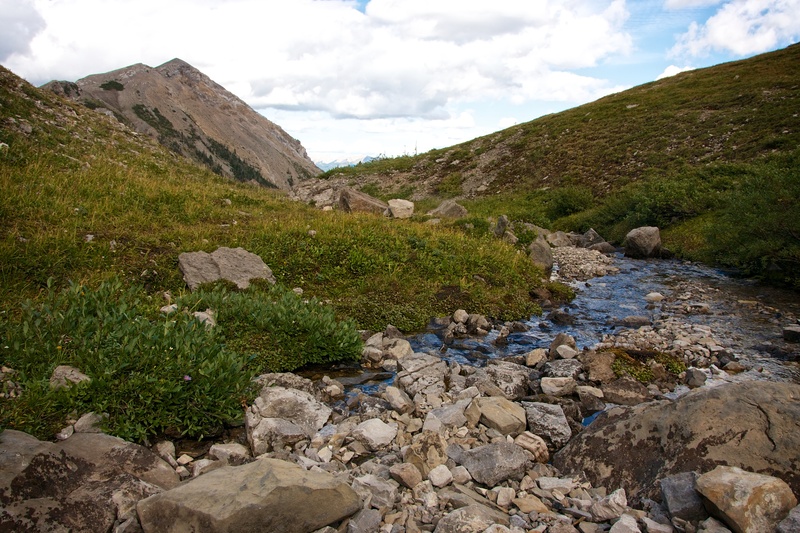 The stream that emerges from the side of Mount Coulthard disappears underground as soon as it reaches the cirque. 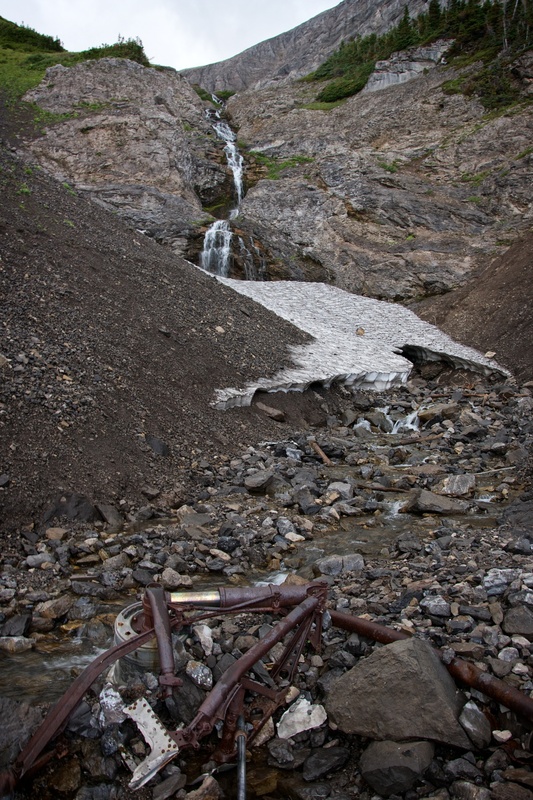 It bubbles out of the ground again in the meadow at the entrance to the cirque immediately above the plane crash site (pictured). 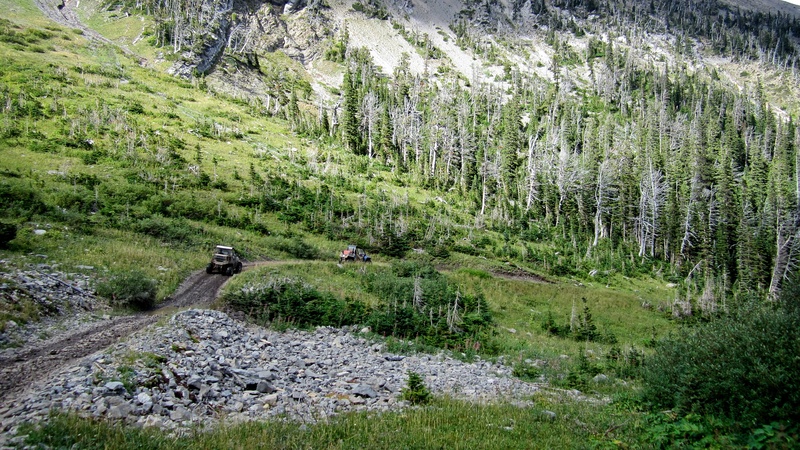 On our way down from the cirque, we ran into a couple who had left their ATVs at the plane crash and were hiking up to see the ‘lake’ which fed the waterfall. They seemed quite dismayed when we told them that there wasn’t a lake, but assured them that the place where the stream emerged from the ground was indeed a beautiful spot. One last look into the cirque before we leave. The south peak is visible on the left. Once we were off the mountain and back on the trail, we ran into at least a dozen people who had arrived at the plane crash on ATVs. Throughout the trip back to our vehicle, we repeatedly had to stand off to the side of the trail so that ATVs going in either direction could pass by us. A rare moment when we had the trail to ourselves. 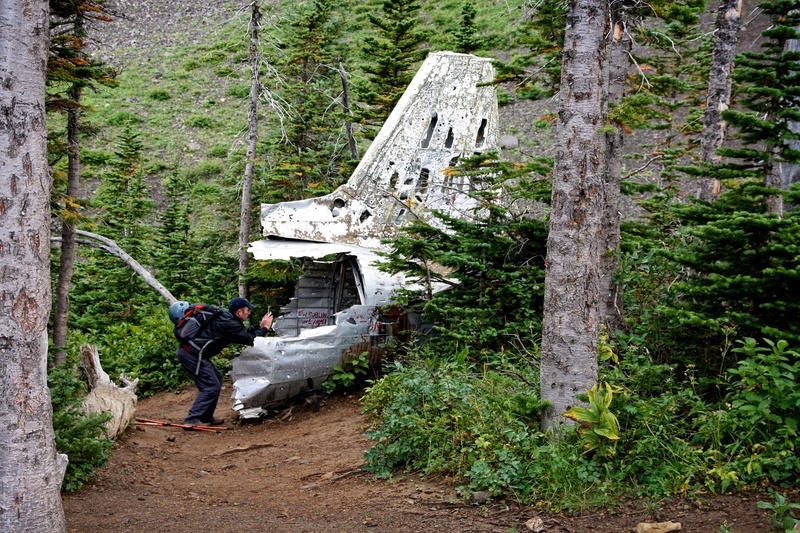 We honestly felt a bit freakish because we were the only hikers around and at least five people riding ATVs stopped to ask if we had walked the ‘whole way’ to the plane crash site. Jeff watches as several quads pass by us on the trail. By the end of the day, runoff from the trail coupled with numerous ATV creek crossings had turned the water in York Creek silty. 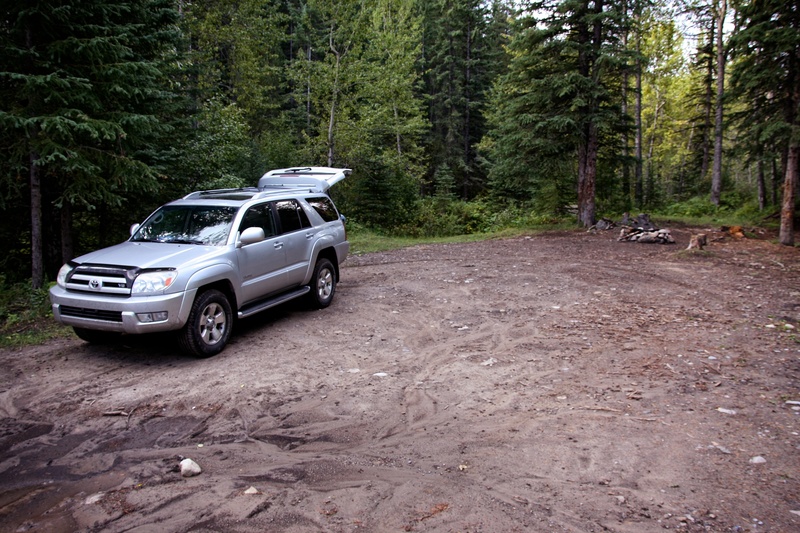 After 23km and nearly 8 1/2 hours, we finally saw our vehicle through the trees. 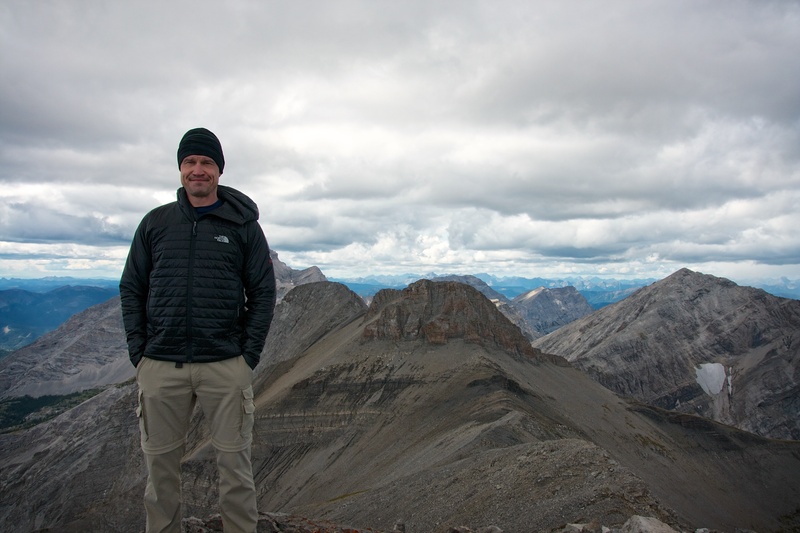 I’d been wanting to climb Mount Coulthard for quite some time and it did not disappoint! 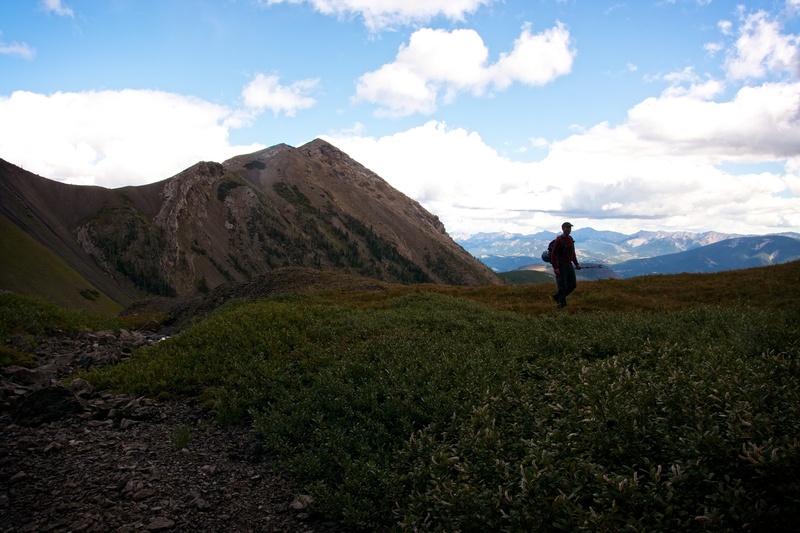 The sweeping panoramic views of the Crowsnest Pass and the Castle are outstanding and well worth the long hike in. Even if you aren’t up to climbing a mountain, the 7.7km hike/bike to the plane crash is also a day well spent. I just stumbled across your blog by searching up Mount Coulthard. I always lovingly refer to it as my favourite place in the world. Strangely, everything you wrote seemed very familiar. I looked back through my photo album and wouldn’t you know it, August 30, 2014. I was one of the ATVs that passed you and had to ask if you “really walked the whole way”. Small world! That’s hilarious Sydney! I’m so glad that you took the time to drop me a note. That was a very busy day for ATVs and while most sped past us, it was very kind of you to stop and chat. That is one of my favourite places in the world too and I’m looking forward to returning there in the summer to finish what I started on Andy Good Peak. Maybe we’ll run into you again lol! Happy Trails!